We'll never forget the incredible All-Ireland Senior Hurling Championship of 2018 but even aside from that it was a year to remember, thanks to the countless stories, small and large, that emerged over the course of the last 12 months. Here are just a few that spring to mind. The true magnitude of Mullinalagtha's achievement is evident that this is the first and probably only time a Longford sports story tops a list like this one. We may be trying to do these in no particular order but it was impossible to look past Mullinalaghta as the first story in this list. Their escapades provided a week's worth of coversation around the country, culminating with their celebratory appearance on the Late Late Show. A moment in a summer of moments, Limerick's All-Ireland final victory was the perfect ending to this year's unforgettable hurling championship. From the drama of the Munster championship, to Joe Canning's last gasp attempt to rescue the final for Galway, the championship was a train ride that none of us wanted to get off. After many many years in the doldrums this was the season Carlow finally made it out of Division Four. They then followed it up with a great win over Kildare in the championship but in terms of building to the future, their league promotion was vital. It was a bittersweet year for the Louth ladies but at the very least, they can take some solace in how they honoured their manager Michael McKeown, who passed away just days after their Leinster semi-final win over Kilkenny. Louth and McKeown had achieved Division 4 National League success earlier in the year and, with the help of new manager, Darren Bishop, the team regrouped to beat Carlow in the Leinster final, before going on to reach the All-Ireland final. Let's face it, if it wasn't for Newbridge or Nowhere there wouldn't have been any craic in this year's All-Ireland Football Championship. Their victory over Mayo was undoubtedly the match of the championship, living up to the hype and then some. There were really two moments in this. The first was Clifford's goal; a instance of brilliance in what was a hugely impressive first summer in the senior ranks for Kerry's wonderkid. This was followed by a explosion of emotion in Clones. Clifford's goal may have stunned Monaghan fans into silence but within seconds the roar of thousands drove Drew Wylie forward as he bounced off half the Kingdom. Monaghan's last drive for a winner would come to a disappointing halt but their day was still to come. For Kerry, Clifford was their perhaps their only shining light in 2018 and this was his finest hour. When they took the field against Foxrock-Cabinteely on 9 December, Mourneabbey were facing into their fourth All-Ireland Ladies Senior Club Football Championship final in five years. Beaten in 2014, beaten 2015 and beaten in 2017 - it did not make for pretty reading. However, driven on by a brilliant Doireann O'Sullivan, the Cork side finally reached the promised land, with a 1-13 to 1-7 win. Making the Ulster final was enough to make this a huge moment for Fermanagh but to do it in the manner they makes it even more memorable. Two points down with barely any time remaining and then this happened. It's fair to say former Kilkenny minor football captain Stephen Scallan stole the show on this year's Underdogs. It may have ended in a bad defeat against Dublin for the TG4 side but for Scallan, he's bounced back from worse losses in the past. From day one there was something special in you, in terms of attitude and spirit. That is why you are still here. That stuff is very powerful. That stuff can take you anywhere. If I was to pick out one guy, I look for practice and improvement in people. Mirco-improvements daily and you are the epitome of mirco-improvements daily in terms of your skills. You didn't have a right foot, then I saw you with half a right foot now I see you with a right foot. If the 30 or 20 other guys in the group had the same application, we'd be in a very good place. While their victory against Scotstown was memorable in its own right, Gaoth Dobhair really came into their own in the days that followed. Rumour has it, some of the lads still haven't returned home! It may not have been witnessed by many outside of the counties involved but Sligo's win in this year's Lory Meagher Cup final was no less remarkable. For their Keith Raymond it was 15 years since he made his senior intercounty debut, as a 15-year-old, and after captaining them to final defeats in 2015 and 216, he finally tasted glory. 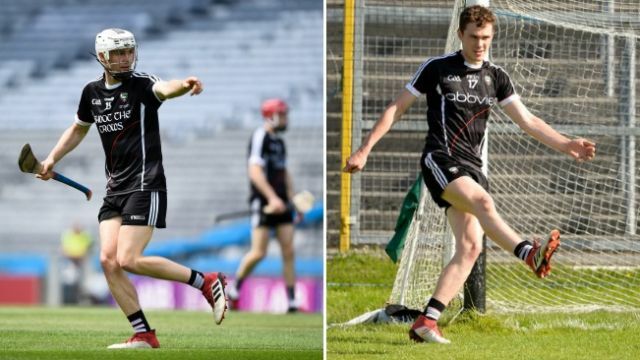 Meanwhile, fresh from playing 70 minutes in the final, their corner-forward Gerard O'Kelly-Lynch hightailed it up the road after the match to come on for the Sligo footballers in their football qualifier defeat to Armagh. When Jame Burke contracted bacterial meningitis over the Easter period he was taken to hospital, put on five antibiotics and placed in an induced coma. Just a couple of months later he would score eight points in the Christy Ring Cup final win for Kildare. Can’t imagine a more remarkable story in Irish sport this year than that of James Burke. Put in an induced coma at Easter with bacterial meningitis. A couple of months later scores 8 points, 5 from play in a Christy Ring Cup winning team. Inspirational. Well done young man. A minute into injury time, with the sides level, Patrick Hogan gathered the sliotar and looked like he was about to bury the winner before Nickie Quaid pulled off a miraculous save out of nowhere. His save forced the match into extra time and the rest, as they say, is history. Even though I've literally listened to Cyril Farrell explain to Balls.ie the difference between a wristy hurler and a normal hurler I don't think I truly grasped the concept until I witnessed Peter Duggan score that wonder point against Galway.